While some plants – like broccoli, corn, lettuce, and cabbage – grow just fine on their own, others need a support system in place to ensure they are strong, healthy, and productive. Not only will tall supports increase yield, they can help conserve space so you can add more plants to your garden. By lifting and spreading the plant, supports also promote good air circulation; this has the twofold benefit of drying the foliage much faster after watering or rainfall, which in turn discourages disease and pests. 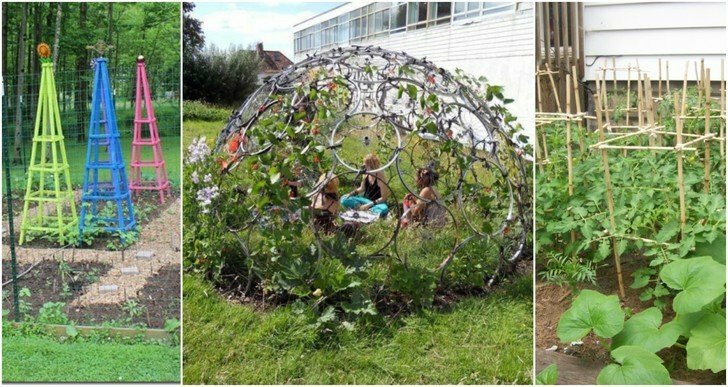 And by making supports out of everyday objects, you’ll save money and add unique, visual interest to your green spaces. Support structures should be added when the plants are still quite young. This has the advantage of training them to grow upward before they are established, so install a support when plants are introduced to the outdoors as transplants or seedlings. What Kind of Support Does Your Plant Need? There are several types of support systems to choose from, but which type of support works best for each type of plant? Vining plants are vertical growers that evolved to cling to anything in their immediate environment, such as other plants, trees, and rocks; this allows them to reach the sunlight without needing to expend much energy on developing their own support tissues. Vining plants climb with the aid of coiling tendrils, or hooks, or by way of their roots or leaves. Examples of climbing vines include cucumbers, grapes, peas, squash, clematis, ivy, and kudzu. 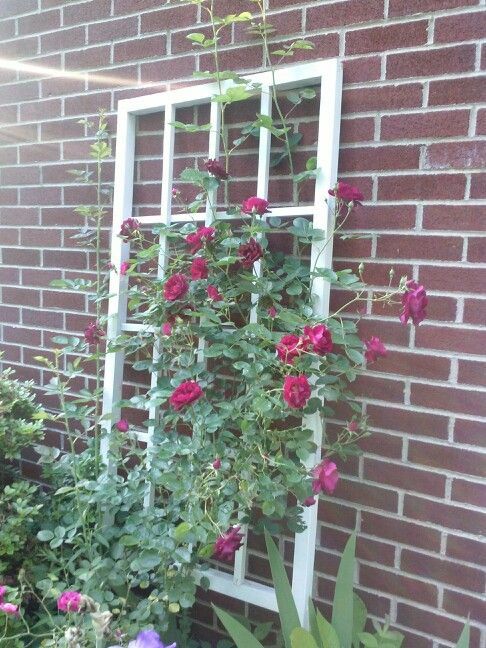 You’ll want to support climbing plants with cages, arbors, and trellises. Notable for their habit of spiralling around the support, twiners use their main stem to grow upwards in a clockwise or counter clockwise direction depending on the species. They will grasp on to, and twist around, anything they touch. Pole beans, morning glory, honeysuckle, and wisteria are good examples of twining plants. Support twiners with the help of trellises, teepees, and arbors. These types of plants do not climb but still benefit from having a support structure. Sprawling plants tend to get quite heavy as they fruit, which increases the risk of breaking branches and stems. They may even collapse entirely. Sprawlers include tomatoes, eggplant, and peppers. Cages and stakes are good support systems for sprawlers. Characterized as a tangled, prickly shrub, bramble plants tend to flop over as they grow. They can be difficult to harvest, and their dense, thorny canes can make the foliage a hotbed for mold and mildew. Blackberries and raspberries are examples of brambles. Support brambles with a specialized bramble trellis. The flexible yet strong and durable branches of the willow tree are an excellent material for making teepees and trellises. Collect a variety of slimmer twigs and thicker branches and bend and tie the structure into shape. A simple and functional design, cages can be constructed in short order with bamboo stakes and some twine. An easy project that’s practically free, wire coat hangers are deconstructed to make a sturdy wire mesh. Don’t worry if it’s not pretty, your plants will fill it in with lovely foliage and flowers in no time. If you have an old patio umbrella laying around, this teepee project is pretty much ready-made – just be sure to bury the main pole and stakes fairly deep to prevent it from falling over. 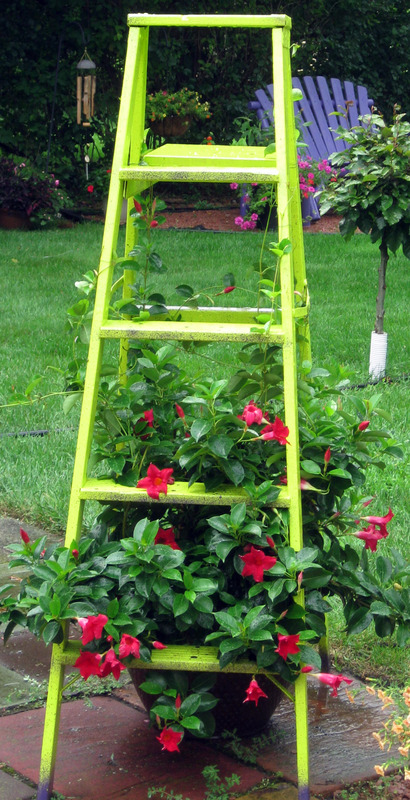 Slap on a bright coat of paint and a basic ladder transforms into an eye-catching A-frame trellis. With built-in mesh and spiralling springs, the inner part of an old box spring mattress can be the perfect object for your vining plants to climb. Once the kids are grown, you needn’t rip out their old swing set – just plant some climbers at the base of this eye sore to turn it into an attractive focal point. At just the right size for your potted clingers, all you have to do is stick it deeply into the soil. Remove the glass panes from an old wooden window frame to allow your twining plants to grasp and coil around the inner grid. Plunked into a container or hanging basket, the long arms of a vintage chandelier or candelabra gives your clingers a longer reach. Bramble trellises usually to take the form of a box or rectangle to enclose your raspberry or blackberry patch. This DIY can be easily adapted to your needs, all you need are bamboo poles and some twine. For instructions on how to make a more permanent set up, check out this video. 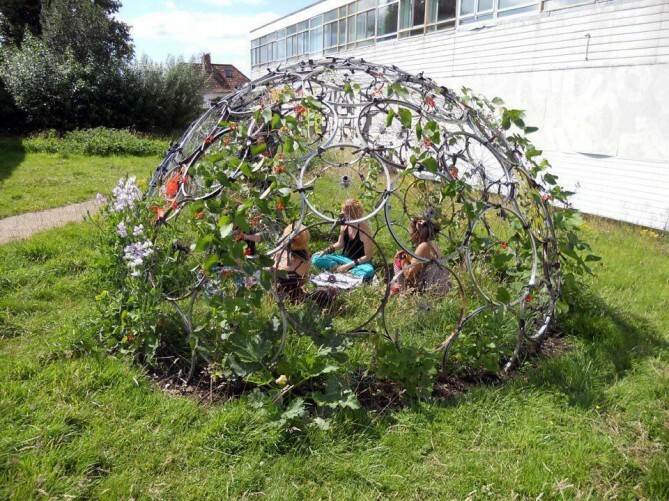 A unique take on an arbor/trellis combo, the dome is made by zip-tying several bike wheels together to construct a half convex shape. Here is an example of what it might look like once some plants are added. Two salvaged doors can be transformed into a lovely arbor for your garden pathways. A sturdy support that can be easily disassembled for winter storage, these are made by inserting PVC pipes into elbow and cross pieces to create a 34” tall cage for tomatoes and other sprawlers. Perhaps you already have a pile of wire tomato cages. No need to toss them out, they can be beautified by spray painting them in a variety of bright and bold colors. 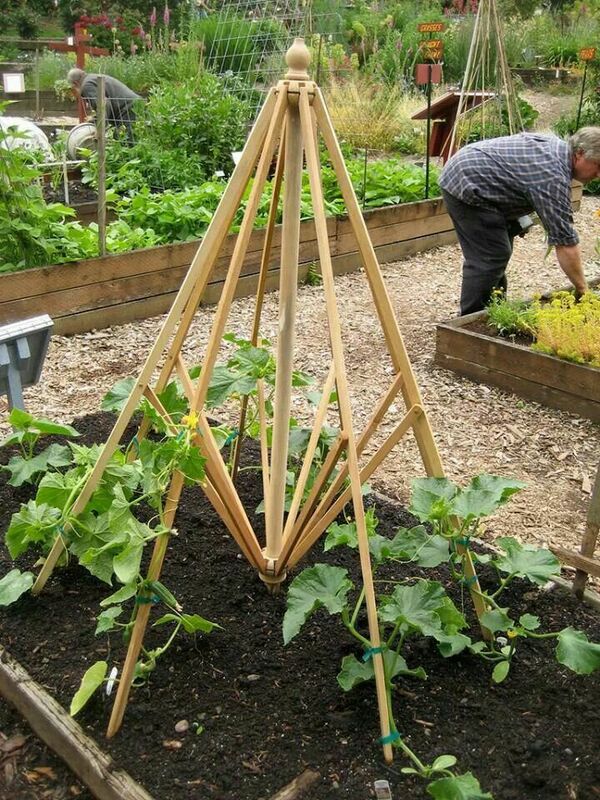 This majestic teepee-style trellis isn’t hard to make and costs just $10 in materials. Using the slatted sides from an old baby crib and a few strategically placed zip-ties, you can make an A-frame trellis in about 5 minutes. A trellis for container gardens, use a collection of branches large and small to craft an oblong orb that looks great while you wait for the foliage to fill in. An easy and inexpensive project, the best thing about this trellis is that you can bend the wire into any shape or design to create a living wall of art. Making a trellis is just of one of the many ways to craft useful stuff from wooden pallets.